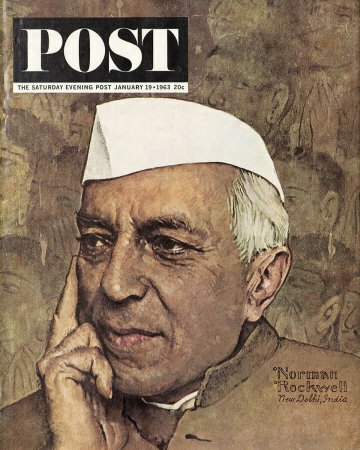 Portrait of Nehru, a Norman Rockwell painting , appeared on the cover of The Saturday Evening Post published January 19, 1963. This is another timeless favorite of Rockwell collectors, a classic for all the ages. This painting was Rockwell's 319th overall out of 322 total paintings that were published on the cover of the Saturday Evening Post. Rockwell's career with the Post, spanning 47 years, began with his first cover illustration, Boy With Baby Carriage in 1916 and continued through his last, Portrait of John F. Kennedy, in 1963. This was also the first cover for The Post in 1963. In 1963, there were five Norman Rockwell Saturday Evening Post covers published. One of the covers, the final Rockwell image on the Post cover, was a reprint of the 1960 Portrait of John F. Kennedy, republished in memoriam. The original oil on posterboard painting, 20 x 17.5 inches or 51 x 44.5 cm, is part of a private collection. One study is also reproduced in Norman Rockwell Catalogue on page 238. When Norman Rockwell first met with the Indian Prime Minister, the subject of the painting was wearing a dark suit. The next day, when Rockwell and his wife Molly, his photographer, met with the Prime Minister, he was also wearing a dark suit. This occurred during the cooler months when darker clothing was the norm. Rockwell asked Nehru to please put on different attire. He explained that the American people would wonder why he did not dress like a maharaji, if he was depicted in a dark suit. Nehru obliged Rockwell and the American public by changing clothing. The original painting shows much more foreground and background detail than what was published on the Post cover. The original painting features a greater portion of Nehru, not just his head and shoulders. In the original, Rockwell show him wearing a red rose on his chest. We can also see part of the back of the chair Nehru was sitting in. The parts I really like about the original painting are two stylized representations, one on each side of Nehru's head. They represent his dual roles as Prime Minister. Ons shows a warrior and one shows a peacemaker. Portrait of Nehru was only one of 322 Norman Rockwell Saturday Evening Post covers; Here is the list of Norman Rockwell Saturday Evening Post cover illustrations. The background shows different people from all walks of Indian life, whom Nehru is responsible for.A few of them seem to be speaking to him. One interesting aspect of the making of this painting is that Norman and Molly also were able to meet Nehru's daughter, Indira Gandhi. She was also a big fan of Rockwell's art, having a whole room lined with Rockwell's art for her children to enjoy. Do You Have A Great Story, Opinion Or Contribution About Portrait of Nehru?